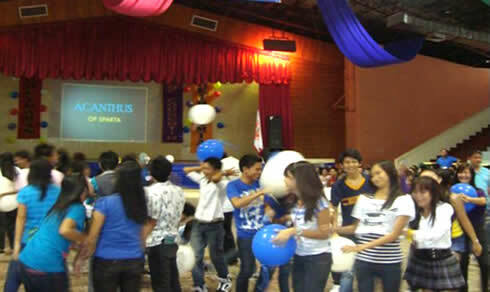 BPE Freshmen Batch Acanthus celebrating as the batch named is unveiled. College of Physical Education, Recreation and Sports warmly welcomes Batch Acanthus, the Bachelor of Physical Education and Diploma in Sports Coaching freshmen for school year 2011 – 2012. The newest batch of the CPERS family got their name in a form of honoring one of victorious athlete in footrace events in ancient Sparta, Acanthus the Lacedaemonian. A short welcome and orientation program was held at the Juanito Bruno Gymnasium last June 30 for the formal unveiling of the batch name. The College Dean, Prof Elmer M. Labad together with his department heads also oriented the freshmen of the different services the college is offering and the various functions of each offices and departments the college has. A campus tour was also held in the morning. Currently, the college has a population of 527 students coming from its (BPE) Bachelor of Physical Education, (DiSC) Diploma in Sport Coaching, (DiPE) Diploma in Physical Education, and (MSPE) Master of Science in Physical Education programs.